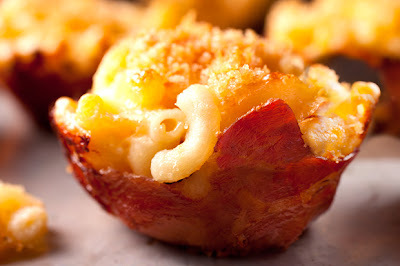 I am in love with these macaroni and cheese filled prosciutto cups from Chow.com....They are so scrumptious, indulgent and yet a little fancy, all in a few bites. 1. Heat the oven to 375°F and arrange a rack in the middle. 2. Bring a large saucepan (about 4 quarts) of heavily salted water to a boil over high heat. Add the pasta and cook according to the package directions. When the pasta is al dente, reserve 1/4 cup of the cooking water, then drain. 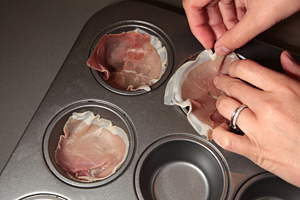 Place 1 slice in each well of a 12-well muffin pan, pressing the prosciutto evenly into the bottom and up the sides of each well; set aside. 4. Meanwhile, melt 1 tablespoon of the butter in a small frying pan over medium heat until foaming. Add the panko and cook, stirring occasionally, until light golden brown, about 4 minutes. Remove the pan from the heat and set aside. 5. While the pasta is draining, rinse the saucepan and wipe it dry. Melt the remaining 2 tablespoons of butter in the saucepan over medium-low heat until foaming. Add the flour and whisk until smooth. Cook, whisking occasionally, until the flour has darkened slightly in color, about 2 to 3 minutes. 6. Add the milk very slowly, whisking it into the flour-butter mixture. Continue cooking, whisking constantly to smooth out any lumps, until the mixture simmers and thickens, about 6 to 7 minutes. 7. Remove the saucepan from the heat. Add the reserved pasta water, cheeses, mustard, measured salt, and pepper and whisk until the cheese has melted and the mixture is smooth. Add the drained pasta and stir to combine. 8. Divide the pasta mixture among the wells of the prepared muffin pan and sprinkle with the reserved panko. Cook until the edges of the mac ’n’ cheese cups are bubbling slightly and the tops are light golden brown, about 25 to 30 minutes. 9. Remove the muffin pan to a wire rack and let it cool for 5 minutes. 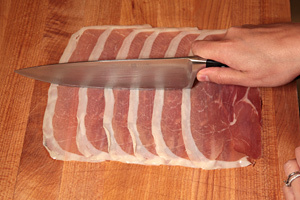 Run a small knife around the perimeter of each well to loosen and remove the prosciutto cups. Serve immediately.